Thanks you so much for your interest in wanting to contribute to HorseConscious. It’s very easy to get involved, just follow the steps below and if you have any questions, please contact us here. Please carefully read our Philosophy and absorb its meaning. If you align with and resonate with it’s intention, then please proceed. HorseConscious is an invitation to explore the world of horses beyond horsemanship. Partnership is our starting point. A deep, rich and mutually rewarding relationship is our goal. Our wish is for people to discover for themselves the joy that comes from shared kindness, respect and appreciation with the horses they share their life with. We therefore celebrate the joy of true partnership as well as the healing and inspiration horses provide. – Stories, poems and art inspired by horses. – Funny, cute, interesting and heart-warming videos (max length 3-4 min). – One-off articles where you want to comment on a particular news topic. – Ongoing commentary on a particular topic or theme. For example, you might like to tell us the story of your journey with an ex-thoroughbred or rescue horse you adopted. To submit items in the first 3 categories, simply email them to [email protected]. If you are interested in writing a regular column (minimum once per month) on a particular topic, then email [email protected] with the details of the topic and why you want to write about it. Always include a photo with your submissions when possible as the site is very visual as you have seen. However, these MUST be photos that you own the copyright to, DO NOT just download images from the internet. This can be very costly if they come from the wrong source! HorseConscious is a great place to build your personal brand. 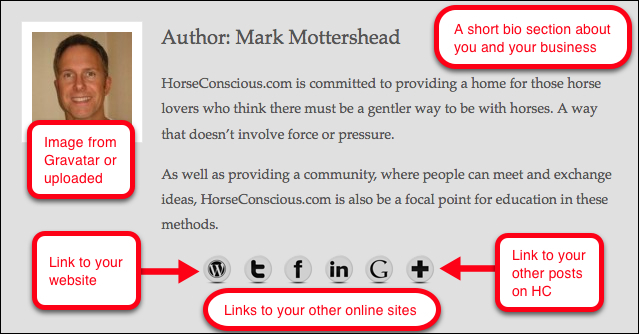 In fact, the site is all about you — the community of equine experts who are always willing to share your resources. Each day, we’re telling the story of this community, which both our readers and contributors are a part of. On top of this, I am now focusing my almost complete attention on promoting the site. As you may already know, I (Mark) am a marketing junkie, I simply love it. I take every opportunity I can to soak up not just the latest online tactics but also the time-proven marketing strategies that have worked since the beginning of time because while people change human nature doesn’t. So what does this mean to you? Well, whilst you are contributing excellent, helpful articles to HorseConscious, I am using a powerful cocktail of paid, free and social traffic to drive more visitors to the site. So by leveraging our joint efforts through your content and my marketing, we both gain more exposure and therefore more business. In addition to this, as a contributor and HorseConscious Business Member you will be receiving from me free training and current best practices guidelines for marketing your business delivered to you via email. Now I appreciate that you are busy too and may not have the time nor the inclination to study and implement this material, which is why I am also developing a series of strategies whereby I can take care of some of marketing of your business and we both profit. The proverbial win-win. Sound good? – Regular articles across a range of different subject areas. See our list of current categories below but let us know if you think we need to add new categories or sub-categories to this. – One-off articles where you want to comment on a particular news item. – Ongoing commentary on a particular topic or theme. For example, you could write a regular Q&A column answering reader’s questions. An easy way of doing this is using audio or video and we’ll even show you how to do it if you are not too tech-savvy. The aim of all content you submit to us is to provide value to the readers, build community and build trust in you, your business and HorseConscious. Focus on making your articles conversational, approachable, entertaining and informative. Tell stories and give examples that help illustrate your ideas and methods. We are looking for helpful, informative content… not sales copy. We want you to sell YOU, the horse expert, on HorseConscious… not your products and services directly. As mentioned above, the content should be regular, a minimum 1 item per quarter = 4 per year. This requires a very small investment of your time and in return our goal is to give that value back to you many times over. – All content must be high quality, detailed and unique – This is very important, so please DO NOT REUSE content from your site or anywhere else, make it unique. Google does not like duplicate content, so reusing content does not help either of us or support our long-term relationship with the reader. – Aim for an article length of a minimum of 1,000 words with no ‘fluff’. You can always make a post more substantial by adding details and steps, so please take the time to write a really helpful post. – Only include links within the body of the post if they directly support the content – It doesn’t matter if these links go to your site or a.n.other site as long as they help further educate and inform the reader. – There is a notification box in the comments section so make sure you check this to be notified of any new comments. 1) Always include an image and/or video with your content. However, ONLY submit media that you have full copyright to, do not just take any image from the internet. This is EXTREMELY IMPORTANT!! Getty images regularly sends out $5,000 invoices for images used without their permission. 2) Instead of an article, you may also submit video as content. All the above guidelines still apply: High quality, educational content that fits with the HorseConscious Philosophy. Minimum suggested video length: 10 minutes. 3) All guest posts must be edited and proofread prior to submission and it goes without saying, please run spell checker before submitting! Ready And Excited To Get Started?